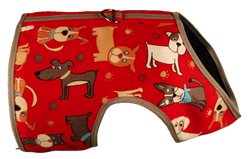 Unisex Harnesses from WagPetGear - Wag Pet Gear! 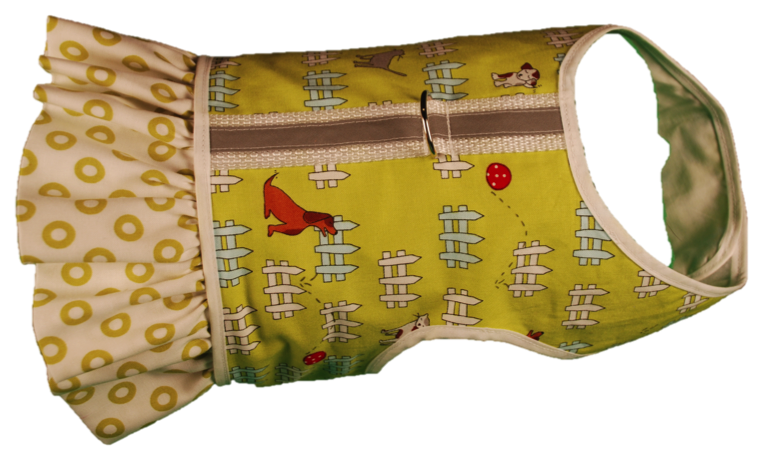 Cute blue, green and brown monkeys adorn this harness and it is trimmed in lime green. If you choose the ruffle option it is brown with small white polka dots. The body of this harness has a geometric turquoise and white design. It has dachshunds wearing sweaters down the back. If you choose the ruffle option it is orange with white polka dots. This harness can't help but cheer you up. It is bright orange with small white polka dots. It has orange trim with small turquoise elephants down the back. It is trimmed in white. For the pet who likes to monkey around! This harness has a tan background and is covered with gray "sock monkeys." It is lined with red and white stripe and trimmed in red. A red with white polka dot ruffle can be added. See the matching leash in the Leash department. Without the ruffle, this harness looks cute on boys as well as girls. It has a bright lime green background with white and pale blue fences on it. Random dogs and cats are scattered around the fabric as well as red balls. The ruffle is white with lime green circles. This harness could appeal to both boy and girl dogs. 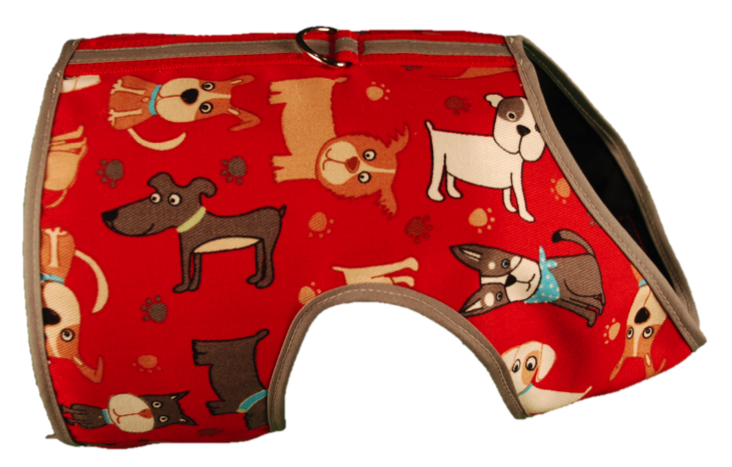 It has a bright red background with gray, white and tan dogs. It is trimmed in gray.